Cooling system is with its cooling pad paper. 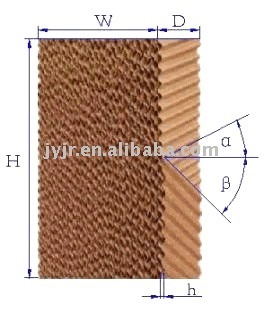 There is a thin layer of water film on surface of wave-like fiber paper. When outdoor dry and hot air is drawn by fan through the wet cooling pad paper, the water of water film will absorb the heat in air and evaporate, taking away large amount of heat. Thus, the temperature of air going through the wet cooling pad paper is reduced. Through such treatment, the wet and cool air comes in house. After mixing with indoor hot air, exhausted by fans, and during cooling, the waste and dust in outdoor air are cleaned, which increases the amount of oxygen in air, makes indoor air fresher, and improves air quality in working environment.